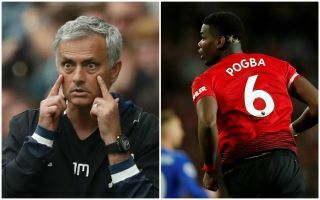 Man Utd have reportedly responded to claims on Thursday morning that the relationship between boss Jose Mourinho and Paul Pogba has soured significantly. According to The Sun, the pair were involved in a row which has left their relationship in a bad way, as it follows on from Pogba speaking publicly last week and hinting that he was unhappy, as per The Guardian. Things appear to be going to plan on the pitch as after being handed the captain’s armband for United’s opening Premier League game against Leicester City last Friday, which they went on to win 2-1 with Pogba scoring an early penalty, all seems well at Old Trafford on the surface. Nevertheless, the report above would have added fuel to the fire of speculation that things are great between the French international and his Man Utd boss, but that seems to have now been dismissed by the club. As per Sky Sports, United have labelled the report as “absolute nonsense” and have described the relationship between the pair as “good”. Without fly on the wall knowledge of the Man Utd dressing room, it’s difficult to know which reports to believe, but what will matter most to supporters and the club is that the pair are working together to ensure that the right results arrive on the pitch this season. As per the Daily Mail though, Pogba continues to be linked with a move to Barcelona, which seems impossible this month given that the transfer window is already closed for English clubs and so the Red Devils have no way of immediately replacing him. However, should the reported issues continue, perhaps we will know in January or next summer as to whether Pogba and Mourinho will continue to work with each other for the long-term future.